Argentina Presidential Campaign: Harbinger of Deep Change? As the 2015 presidential race begins to take shape in Argentina, the leading candidates – Daniel Scioli (Frente para la Victoria, FPV), Mauricio Macri (Propuesta Republicana, PRO), and Sergio Massa (dissident Peronist faction Frente Renovador, FR ) – have already begun to outline their visions, but sweeping change doesn’t yet appear on the horizon. According to early polls, Massa had a strong start in the runup to the August 5 presidential primary, but his popularity has faded, making Scioli and Macri appear to be the real contenders. Originally considered an unexciting three-way race, it has now become a polarized contest. It should come as no surprise if campaign speeches start to follow a continuity-versus-change line. The fact that Scioli has named Carlos Zannini, President Cristina Fernández de Kirchner’s legal secretary, as his running mate has been a game-changer. The Scioli-Zannini effort to bridge two different factions of the FPV, namely the left-wing Kirchnerites with more business-friendly Peronists, will demand tons of rhetoric. This ticket casts them as guarantors of continuity: el modelo with some modifications. Yet in electoral politics, almost everything is about framing – explaining to core and potential supporters how new decisions, which for all their twists and turns, remain faithful to the flags of the party. This is when Peronism gets real. The Zannini gambit on the Peronist side prompted Macri to follow a pure PRO formula, naming Gabriela Michetti, a former deputy-major of Buenos Aires City, as his vice-presidential candidate. This ticket bets on the idea that most Argentine voters reject the government and want substantial change, while polls suggest that many just opt for moderate adjustments. Macri’s record indicates that he would propel a more pro-business government than that of Fernández de Kirchner, but his victory would not portend a return to the neoliberal heyday of the Menem years during the 1990s. Sergio Massa, on the other hand, is the plain-speaking candidate of the dissident Peronist faction who’s challenged by the FPV and PRO candidates to duke it out over the issues. Polls indicate that he will draw 15 percent of the votes in the election – making him an important powerbroker. 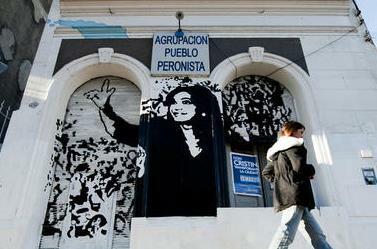 These early stages of the campaign reflect a recurrent pattern in Argentina’s political landscape: a tendency of ruling party candidates to move away from incumbents with lofty rhetoric but little specificity on the one hand, as opposition candidates issue harsh criticism while at the same time manifesting a reluctance to embrace radical change. Scioli seems to be going all-out Kirchnerite, but it’s too soon to judge whether the electorate will follow, or whether once in office he would govern as if it were Cristina’s third term. He and Macri both aspire to grab Massa’s 15 percent, as it could enable them to win the presidency in the first ballot rather than having to contest a second round of voting between the two top vote-getters. But he hasn’t stated a credible price, and neither Scioli nor Macri seems ready yet to begin bargaining with him. President Fernández may have avoided plunging the economy into crisis before she steps down, but her successor will definitely have to make tough choices because the country is mired in recession and cannot access foreign investment. Macri might initially enjoy some leeway to introduce austerity measures that would clean up a good part of the macro-economic mess and reopen Argentina to international capital markets, but even he – like Scioli – is likely to be constrained by embedded Kirchnerism in Congress and in the ministries. Those in Argentina and beyond who have dreamed that Kirchnerism’s days are numbered will have to wait to see. Kirchnerism, Argentina’s latest “ism,” has profoundly altered the political and ideological landscape – and, at this early point in the campaign, it appears likely to continue to be part of the country’s political ethos into the future. It could even turn out to be the dominant force in the administration that takes office in 2016.